The "Unable to open VCA Engine " error message popped up when open Mainconsole. After clicking OK, another error message "fail to control object" shows up. 1. The IVS trial license is expired. 2. The IVS license was transferred but the IVS channels are existed. 3. You activated the IVS license but didn't assign it to IVS channel. Step 1: Go to "General Setting > Video Analytics > Intelligent Video Surveillance". 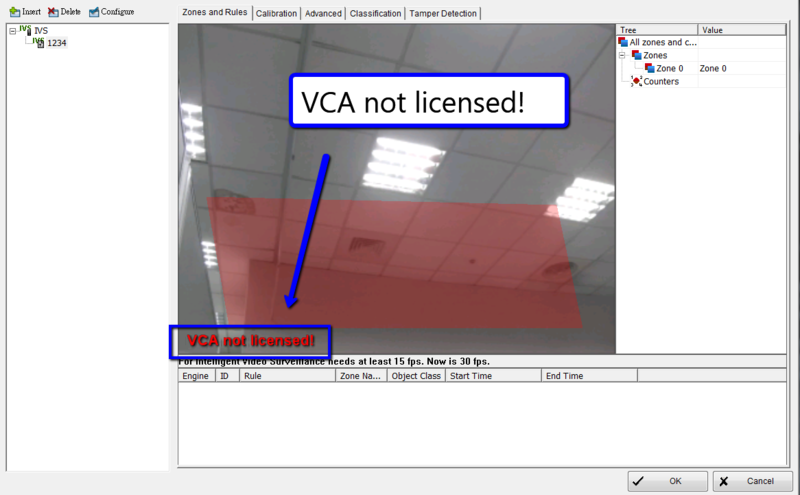 If the message "VCA not licensed" shows up on the bottom of the screen, it meas the IVS trial license is expired (The IVS trial license will be valid for 45 days). Step 2: If the IVS licenses are expired, transfer the expired IVS license. If it doesn't have expired message in any IVS channel or you used formal IVS license, please jump to Step 5. Step 3: Check how many IVS channel licenses you need. Contact your region sales manager to get new IVS trial license or purchase the formal IVS license. Step 4: Activate the new IVS trial / formal license. Step 5: Go to "General Setting > Video Analytics > Intelligent Video Surveillance", click "Configuration" to assign IVS license to IVS channel. Make sure each IVS channel have been assigned IVS license. Step 6: Click "OK" to complete the setting. The error message will not pop up anymore.